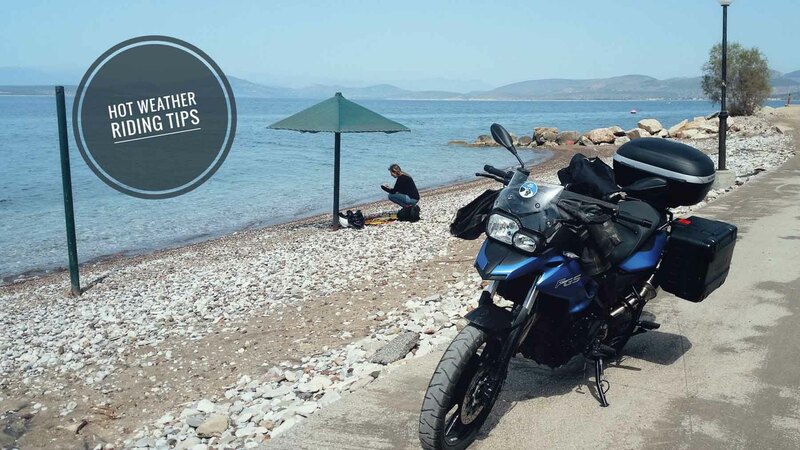 Greek summer gets hot but that should not prevent you from having an enjoyable summer biking vacation, so here are our tips for motorcycle riding in hot weather. We live in this land blessed with sunshine for 300 days a year, so we know what to do to cope with heat. We will assume you are a person who wants to ride wearing – at least some – protective apparel. In this case, high temperatures during summer can degrade your riding experience, create discomfort and you will not enjoy the ride. 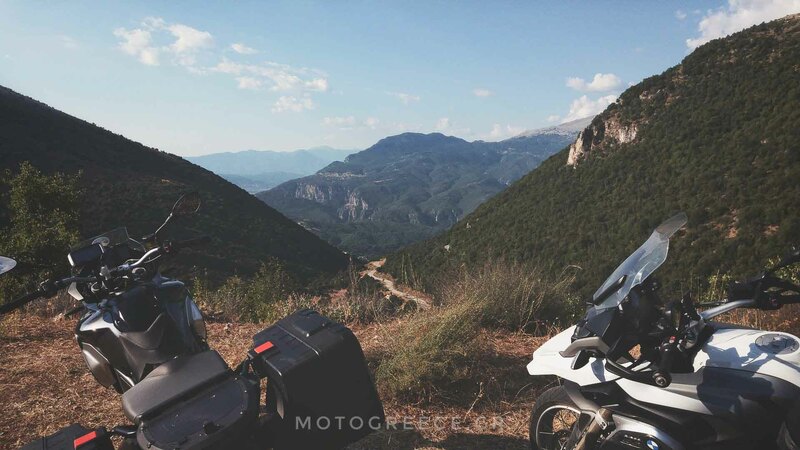 We strongly suggest bringing textile jackets and gloves that are designed for riding in hot regions. If you don’t have one, we may be able to provide you with some! Big mesh panels and/or ventilation zippers in the chest, shoulders, and arms are they way to go. On one hand absolute impact protection and abrasion resistance is reduced with these light fabrics. But on the other hand, by reducing the chances of getting a heatstroke, heat exhaustion, or getting dehydrated, is important as these are conditions that present the risk of reducing your reflexes, your focus, and your ability to ride safe! So choose textile, and choose ample ventilation. For your lower body you can choose textile pants that also have mesh panels in selected areas and or ventilation zippers. Another option is the denim pants with kevlar (or other similar material) liners in areas that are most likely to be affected in case of a crash. Do not leave your skin exposed! Some might think that since they will be riding at low speeds, a t-shirt or a short-sleeved garment will be acceptable. Their rationale being that the flow of the air around the skin would keep them cool while they ride. Unfortunately, this is wrong! Exposing your skin to the scorching sun for the duration of a ride, is a bad, really bad idea. We have seen it countless of times. Tourists who ignore that the sun is strong enough to easily cause skin burn and they end up suffering with very bad and sometimes severe burns from the sun. It will only take 20-30 minutes under the strong afternoon sun in Greece for a light colored skin to get burnt! On top of that, exposing your skin to the hot sun and to direct contact with hot air, leads to even faster dehydration so you get tired sooner. 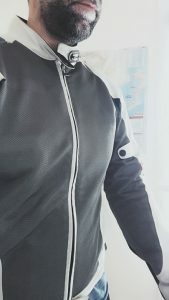 If nevertheless you insist on not wearing your protective riding jacket, then at least wear a long-sleeved shirt and also cover the back of your neck with a bandana/ neck-tube or scarf made of silk or coolmax material. Heat stroke or heat exhaustion can happen before you know it. It is important that you drink water or electrolytes regularly, before you feel the thirst kicking in. Don’t wait to feel thirsty. Use a camel back (or hydration bladder or whatever you want to call it). Most of them can be inserted or kept inside your backpack. If you don’t have one, make a habit to carry a small bottle in your backpack or in the panniers of the motorcycle. 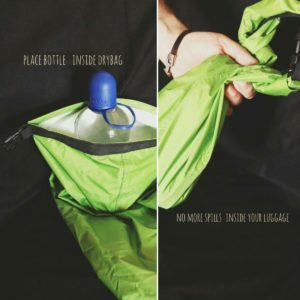 Worried it might spill and get everything wet in your luggage? See the pics below for a good tip: use a waterproof drybag with a roll-over closing top and put inside the water bottle! You can get such small dry bags for cheap from outdoors/camping stores for example. And they are effective! Instead of doing 300 kilometers a day, what would you say for settling at 200? Plan your routes and itinerary accordingly, so that you avoid staying on the saddle for long hours. Keep distances reasonably low and make lot’s of short breaks. Cover distances early in the morning before the heat builds up. When the afternoon comes, take a break. Chill out at a cafe or a taverna and continue your ride after 16:00. You are in vacation after all, relax! Don’t worry that you might waste time and loose your day. In summer months in Greece daylight holds until around 21:00, so you have big days and plenty of time to roll. In case you do have an afternoon break in a taverna, resist the idea to drink alcohol not just because we should not drink and drive, but also because alcohol affects your metabolism in a way that intensifies the water consumption in your body. So you get dehydrated ! And you will feel tired sooner! Keep a relaxed riding pace. Intense riding raises the hydration needs of your body and leads to exhaustion faster! You are on vacation, why push it? Explore and ride in cooler regions. Coastal routes will be cooler thanks to the sea breeze. Also areas at higher altitudes have considerably more pleasant temperatures. So go explore the mountainous Greece! Some of the most iconic and historic villages are located in regions away from the low lands and also away from the beaten path, while still presenting exceptional experiences for the visitors. If you are not sure where to go, or you are having difficulties in researching and finding places, just ask us! Avoid mainland territories with low altitudes and long plains and valley floors. They are hotter, since the microclimate there will be more of “continental” type instead of “Mediterranean”. Instead of wearing cotton t-shirts, try some that are made by synthetic materials like coolmax. They are expensive, but they offer good levels of comfort by allowing your body to breathe better and by not trapping heat near your skin. 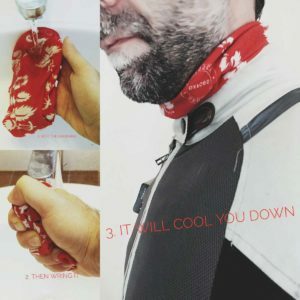 Get a neck tube/ bandana and soak it in water. Squeeze the water out of it, but the bandana stays moist. Now wear it, it will keep you cool for a while! Wet and wring a bandana then wear it!